NOT for kittens less than 6 weeks of age. Wash hand immediately after handling the medications. Only remove tablets that will be consumed immediately from pack. Discard any tablets unused after expiry date. Not only does this generic work just as well as the brand name and for less money, but getting it through Joe's allows me to also treat the feral TNR'd colony outside. Funding the TNR out-of-pocket is tough enough without having to also pay office fees and full-cost medication pricing. I appreciate the choice of generic or brand name, combination wormer or single drug. I've always had excellent results from this generic version and will continue to source it from Joe's. This is the BEST product for worms. Joe's prices can't be beat! This product works perfectly! Other types have made my cats sick, and this one works well with no ill side effects. Thanks Joe! We've used this several times when one of my cats gets puny from picking up worms. 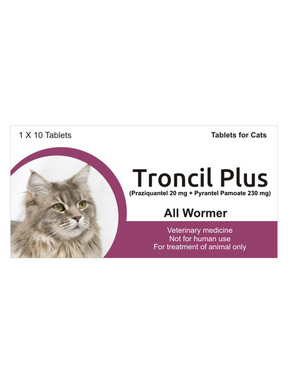 Even though he's indoor, he still manages to get ringworm about once every two years, and using this generic wormer does the trick every time. He hasn't had any rough side effects, and it's very effective. We keep a supply on hand. I definitely recommend it! My cats are depending on these wormers for a year now. Not ever have i seen a worm on their stool since. Thanks. Greatly priced too! I tried different tablets for my Percy. I want him safe and healthy all year round. Now I came across this one and for some reason he didn't fuss about taking it! So Lucky!!! I have bee adopting as much kitties as I can. Thanks to this and your other low cost meds I could get mroe from the shelter and still give them the best health treatments there is. In an old lady point of view, this is a great help!